A transplanted Filipino's blog on Food.... and other morsels. This is one salad that would make your doctor happy. Mention phytochemicals, antioxidants and beta-carotene --elements that are claimed to make us live longer, healthier and look younger, this leafy green mound has it. A Spring Mix is a loose mixture of organic greens(though some are red). It includes one or more varieties and combinations of baby lettuces (Red Romaine, Green Oak, Green Leaf, Lolla Rosa(this is a lettuce not a grandma. We call Lola grandma in the Philippines), Red Leaf, New Red Fire, Tango,Green Romaine) and a mixture of Baby Mizuna, Tatsoi, Red and Green Chard, Arugula, Radicchio and Frisee. Now beat that.You are basically eating a vegetable patch in a plate. The French call this myriad of edible leaves Mesclun, which comes from the word mescla, meaning "to mix". It can be found at the organic produce section of most supermarkets if you can't grow them on your own.Most are already pre-washed and ready for the plate. However,as a precautionary measure against food contamination, it is wise to give the leaves another rinse before eating. This is where a simple salad spinner comes in handy.I emphasize the word simple because there are hundreds of high tech salad and branded spinners in the market that are so attractive too look at but are not worth your while. Buying them will only create an unnecessary dent on your pocket. Basically, a salad spinner uses centrifugal force to whisk water away from the greens . This make them dry and crispy and easier for the vinaigrette or dressing to coat the leaves. If you don't have one, get a clean kitchen cloth or towel, spread it on the table, put your washed greens in the middle of the towel, grab the four edges of the towel to form a basket and enclose the greens. Twirl the cloth around over your head like you would with David's slingshot when he killed Goliath until the greens are dry. If you don't want to look funny in front of your honey doing this exercise, get a cheap plastic spinner at the dollar store or the nearest SM. I got mine for a buck and I have been using it for years with no complaints. It takes a little bit of time to get used to eating these"leaves". If you are used to the standard Romaine or Iceberg Lettuce fare, Spring Mixes introduces your taste buds to another level of raw textures and flavors. Some of the vegetables may be bitter and may take a while for one to adjust to the raw, rough, crunchy and sometimes "eerie" taste even if blended well with the salad dressing. It takes time for most of us born carnivores, to be comfortable with eating cooked vegetables. As kids we thought of them as "yucky "like bad medicine. It took our parents some amount of patience and boy, some mean threats before we can swallow them at our own will and leisure. More so with raw shoots and leaves. It takes a certain sophistication just as it takes time to love munching grass. Like a grass fed cow. 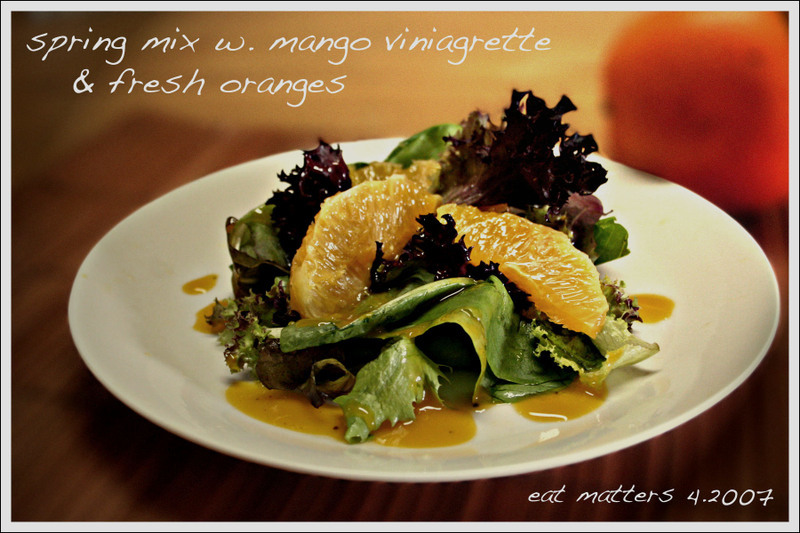 I chose a Mango vinaigrette for this salad because I wanted my dressing to be lighter with an Asian accent. Besides, spring is here and summer is coming. Nothing beats fruit for a perfect dressing. To make the Mango Vinaigrette, I combined Mango puree, rice wine vinegar,a bit of water (to adjust consistency), a dash of cracked black pepper in a bowl and manually whisked the ingredients until they are well blended. you are lucky you got a buy one take one deal as organic greens are usually a bit pricey compared to the regular ones. it is worth the price though. A gourmet is a glutton with brains. -Philip W. Haberman, Jr.